We have a very large yard; the type where you need a riding lawn mower to mow it. We then reclaimed several more yards from the hay field in order to put in a vegetable garden. Next to our vegetable garden there is a rock. It’s not a big rock nor is it tall and that is where the trouble began. You see, we live in the “Granite” state, so when one afternoon my boyfriend was showing me this rock we knew right away that the long flat portion we could see was likely just the tip of the iceberg, so to speak, and there was no way we were going to remove it; at least not without the help of some pretty big equipment. It’s not really in the way, other than you have to be careful not to run over it with the riding lawnmower. The rock gets hidden when the grass grows. One day, while I was at work, my boyfriend sent me an email. “You know what that rock needs?” He asked. “A lawn Gnome!” He replied. “Sometimes you come up with the most amazing ideas.” I wrote back. Clearly I was really busy at work. About three weeks later, my boyfriend went to visit a man selling an old sewing machine. It came up during the conversation that they were moving to Florida and anything left in the yard was either really cheap or free. Wouldn’t you know that in that pile of “stuff” was a three foot, one hundred twenty pound cement lawn gnome. All day long I received emails and text messages about the wonderful “surprise” my boyfriend had for me when I got home. I excitedly wished the day away so I could get home and see. Sure enough, as I pulled in the driveway, there sat the three-foot gnome on the rock by the garden. “See, see?” My boyfriend asked excitedly. “What the heck is that?” I replied. Really “heck” wasn’t the word I used but we try to keep this PG. The look of disappointment quickly washed across my boyfriends face but try as I might I could just not muster the excitement of the gnome. “But you said it was the best idea I ever had.” He pouted. Clearly, I need to work on writing sarcasm. Today, Murray still sits on the rock in the yard. (Yes, my boyfriend named him so now we HAVE to keep him.) 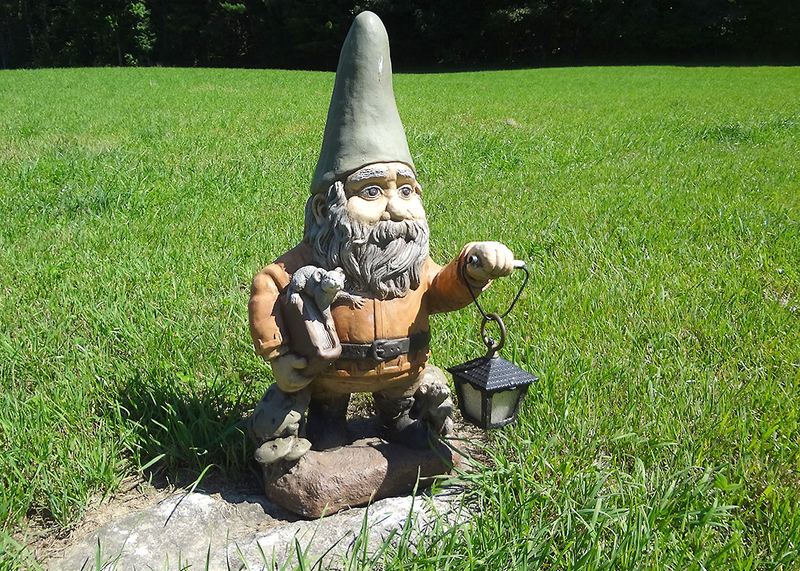 He is a literary gnome as he is holding a book and a lantern. He does have wiring and the little lantern will light up if you plug him in, but I think Murray is quite happy the way he is. At the very least, perhaps he’ll keep the wildlife from snacking in our garden. Great picture. I’m confident that’s the best selfie someone could give a gnome. Thank you. Murray is very photogenic. Great post! 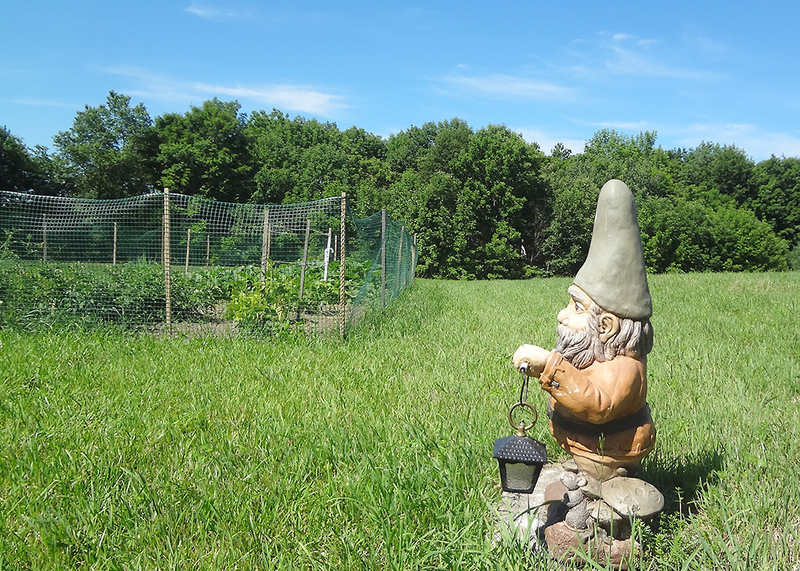 I have about 30 rocks in my yard that I’m constantly mowing around, I’ve thought of flagging them somehow but for some reason never thought of a gnome. Your honey is a genius! That’s my boyfriend. Wile E. Coyote, Super-Genius. Haha, that’s adorably hilarious! 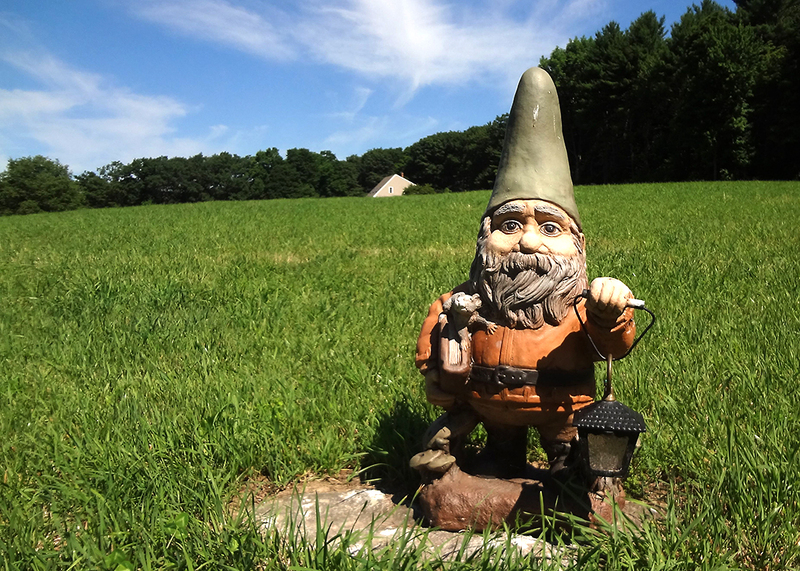 I don’t know how I’d react to a lawn gnome I sarcastically approved of via text… I could see it growing on me.